1. Ruth Bader Ginsburg started at Harvard Law School in 1956 and transferred to Columbia in her third year because her husband had a job in New York. 2. She graduated at the top of her class. 3. We were both law professors. She at Rutgers, me at New College and Golden Gate. 4. We both taught seminars on discrimination, hers based on gender, mine on sexual orientation. 5. We share a nickname, Kiki. 6. We both have two children. 7. During her first year at Harvard she took her classes as well as her husband’s second year classes as he had cancer. 8. She did not get a job in a law firm upon graduation. 9. She became the second woman Supreme Court Justice in 1993. 10. Her daughter went to Harvard Law and graduated in 1980. 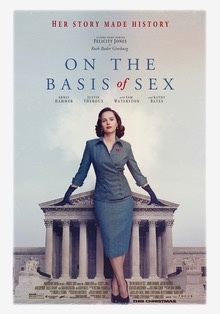 And I loved seeing Kathy Bates, Felicity Jones, and Ruth Bader Ginsburg in this film. Thank you Mimi Leder for directing.